It’s as eventual as that first gray hair or your first wrinkle — squeaky subfloors. As houses settle, as floors are walked across, as seasons change. All of these cause shifts in your subfloor. As plywood subfloors are are put the test and stressed, they eventually start to offer a little give when pressure is applied and the subfloor becomes loose from the flooring joists. This results in a squeak. We all know that squeaky floors can be annoying. It used to be that the only way to fix a squeak would be to rip up whatever flooring was down and repair the subfloor directly. If you’ve already been planning on replacing your old flooring, then fixing the subfloor once you rip up is a great idea. This pretty much involves checking out the subfloor for any water/mold damage and replacing it. If it’s a problem with just wear over the years, you can resecure the subfloor to the joists and you could even add another layer of plywood to increase the structural integrity of the subfloor. But what happens if you weren’t planning to tear up and replace your flooring? Your answer: counter snap screws and/or joist brackets. We have a variety of products for most any situation that will help you get the squeak relief you need. The situation: a squeaky subfloor located above a room with an exposed ceiling. Think of an unfinished basement or maybe a room with a drop ceiling where the tiles can be easily removed to give you access to the underside of the floor above. The solution: Squeak Relief Joist Bracket. These joist brackets are incredibly easy to install. Just find where the squeak is in the floor (this may require a helper to walk around on floor while you are ready below) and then find the appropriate joist supporting that portion of the subfloor. Tack the bracket in place and then use the two screws to affix the bracket, cornering both the joist and the subfloor (as shown in the picture to the left). 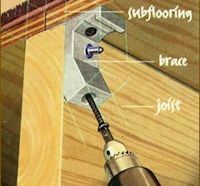 Whatever type of floor you have (hardwood, laminate, tile, vinyl or carpet), you can use joist brackets to fix your squeaking problem as long as you can get to the underside of the subfloor. You can find these Joist Brackets on our site in both a 2 pack (Squeak Relief 2ct.) and a 12 pack (Squeak Relief Contractor Pack 12ct.). The situation: a squeaky subfloor located in a room where there’s no access to the subfloor from the underside. This is very common, as many homes these days incorporated spackle finished ceilings into their design. Counter snap screws are made to be drilled into a surface and then, right at the top of the threads of the screw (swirly part), the head of the screw is scored and meant to be snapped off. This offers the strong hold characteristic of a screw, with the looking of a finishing nail. There are two kits available to be used with the counter snap screws to make it easier for a homeowner to utilize them. One is a starter kit for fixing squeaky subfloors below hardwood and the other is a starter kit for fixing squeaky subfloors below carpet. 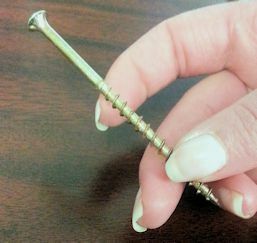 Counter snap screws can also be used in other woodworking scenarios where you’re looking for the strong hold of a screw but with the appearance of a finishing nail (that can be filled). Aside from the kits, you can find packages of counter snap screws on our site here: 50ct. Counter Snap Screw Pack or 250ct. Counter Snap Screw Pack. In the hardwood counter snap starter kit you’ll find: 25 counter snap screws, the screw snapping fixture and a #2 square head drive for your drill. You simply need to find the spot in your hardwood floor from which the squeak is coming from, place the fixture over it and drive the counter snap screw down into it. Once the screw goes far enough into the flooring, you’ll hear a snap. That is the pressure snapping the screw at the scored notch. 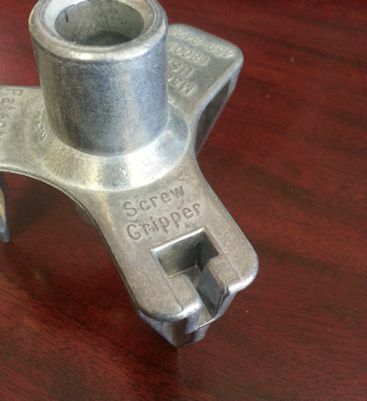 Take away the fixture and the top part of the screw will come with it. Now you have firmly secured the subfloor and can use finishing putty or wood filler to fill in the small hole. You can find this counter snap kit for hardwood here on our site: Hardwood Flooring Counter Snap Starter Kit. In the carpet counter snap starter kit you’ll find: 50 counter snap screws, the clawed alignment & depth control carpet fixture and a #2 square head drive for your drill. The general principle of the carpet counter snap starter kit is very similar to that of the hardwood flooring kit shown above. Find the spot in your carpeted flooring where the squeak seems to be coming from. 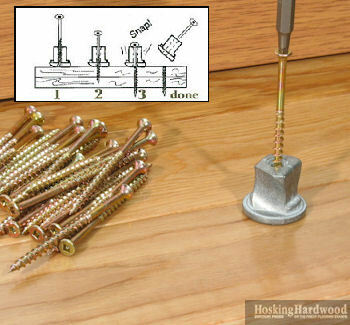 Using the clawed fixture, drill a counter snap screw directly into the carpet and down into the joist supporting the subfloor. 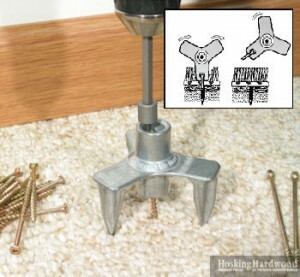 Unlike the hardwood counter snap fixture, the screw with the carpet fixture will not snap immediately. You’ll in picture below, a notch in the carpet fixture. Once you’ve driven the counter snap screw through your subfloor, you simply use the notch in the carpet fixture to break off the screw at the scored notch. The screw will securely retighten the subfloor to the joist but the screw will be broken off below the carpet line, efficiently hiding it from view and you won’t feel a thing when walking across it. You can find this counter snap kit for carpet here on our site: Squeeek No More Kit. The moral of the story is: don’t think you have no other options than to live with squeaky subfloors in your home. With a few easy steps, you can’t fix the squeaks yourself and live in peace. Find all our squeak relief products here: Squeaky Floor Repair Kits. This entry was posted on Monday, May 12th, 2014 at 9:46 am	and is filed under Installation. You can follow any responses to this entry through the RSS 2.0 feed. You can leave a response, or trackback from your own site.